When in Quebec City, make a side trip to see Sanctuaire Sainte-Anne-de-Beaupre in Sainte Anne de Beaupre, approximately 30 minutes away. There's much more to do: take a stroll through Old Quebec, get to know the fascinating history of Place Royale, learn about all things military at La Citadelle de Quebec, and examine the collection at Musee de la civilisation. 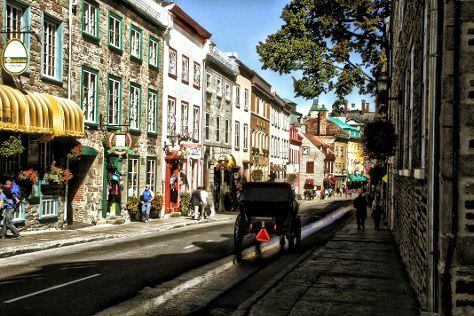 To find photos, other places to visit, more things to do, and tourist information, you can read our Quebec City trip website . San Francisco, USA to Quebec City is an approximately 11.5-hour flight. You can also do a combination of flight and train; or drive. The time zone difference moving from Pacific Standard Time (PST) to Eastern Standard Time (EST) is 3 hours. In November, Quebec City is little chillier than San Francisco - with highs of 50°F and lows of 33°F. Wrap up your sightseeing on the 30th (Fri) to allow time to travel back home.